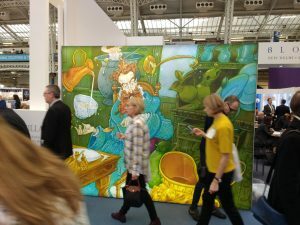 This visit to the London Book fair seems to be turning into an annual pilgrimage for me. For those who have never been to it, this is the biggest event for publishers in the UK. ; it is also a showcase for publishers from around the world and one of the most prestigious events of its kind. It takes place over 3 days in April and there are a huge range of workshops, launches, showcases and parties (if you are lucky enough to be invited). The main reason for the fair is to promote publishers, sell rights to other countries and buy rights from overseas concerns. Teachers and Librarians are not the central audience but there is still plenty for them to enjoy and learn from. This year the focus was on the Baltic states, so there were sessions about publishing in Latvia, Lithuania and Estonia as well as the broader issue about translation. 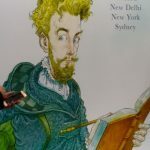 There was also a wonderful exhibition of illustration from these states, which showed the sophistication and skill that is being used in their picture books and even books for an older audience. 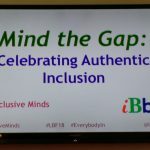 “Speaker Sarah Crossan, Author Peter Kalu, Author Emily Davidson, Young Ambassador, Inclusive Minds Heather Lacey, Ambassador for Inclusion, Inclusive Minds Alexandra Strick, Co-Founder, Inclusive Minds Nikki Marsh, Committee Member, IBBY UK” who were talking about “MInd the Gap: celebrating authentic inclusion” There was an additional member of the panel, but I did not catch her name unfortunately. 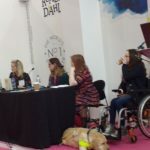 This was a fascinating discussion about the way disability in particular is represented in children’s and YA fiction and it really made the audience think about what is acceptable as both a writer and as an audience. In the afternoon I sat in on the first part of a long session about Illustration in which art directors and designers shared their insights into becoming a published illustrator. As someone who is not good at art this was of great interest and helped with understanding the broader picture (sorry about the pun). On Wednesday I had arranged to meet up with a couple of friends during the day, but I started off by having a wander around the Children’s hub and also the larger stands on the ground floor which had children’s elements; these included Bloomsbury, with some amazing pictures from Chris Riddell, Hachette, Penguin/Random House and Scholastic. At lunchtime I went to the launch of a new book at the Firefly stand; this is a really great Welsh publisher which has produced some fantastic books. 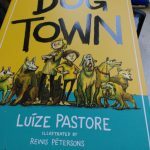 The one we were celebrating at the Fair was called “Dog Town” by Luize Pastore, a young writer from Latvia. I was also able to meet up with the lovely Tricia Adams and the author Saviour Pirotta for a good chat. Also there were Megan Farr from Firefly and authors Miriam Halamny and Eloise Williams. 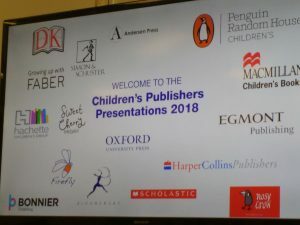 The highlight of the afternoon was the publishers presentations, where about 13 publicists tried to woo us with their up and coming big titles. I must admit that I came away with several pages of titles that I want to read. 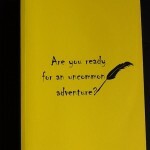 There were several titles from Michael Morpurgo, a new book from Jacqueline Wilson and follow ups from Cressida Cowell Kieran Larwood, P G Bell and Philip Reeve among many. 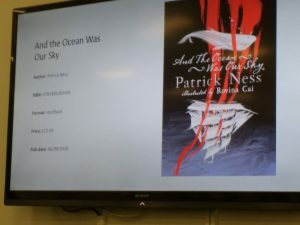 I am particularly looking forward to a new book from Emma Carroll, Patrick Ness and the team of Sarah McIntyre and Philip Reeve. It looks as if we are in for a bumper crop of great titles with a wide range of themes ranging from WWI (to commemorate the end of the conflict), Christmas, fantasy, witches and science fiction. Definitely something for everyone. By the time I got home at about midnight I was feeling exhausted and yet very happy with the events I had attended, the friends I had met and the book suggestions I had received. All being well I will be going back next year. Well, we are now over half way through the summer break and it is about this time that I start thinking about what to read next. If you are anything like me then you will already have got through the pile of books that you had kept for the holidays. So here are some suggestions that you might have missed, or which are just being published. They are wide ranging in their subject matter and a few are ones that I might have missed if I had not been asked to review them, but all of them turned out to be very pleasant surprises. 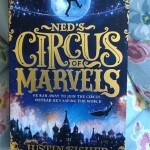 “Ned’s Circus of Marvels” by Justin Fisher. 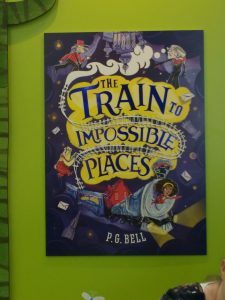 This book has had a very high profile over the last few months and is a great adventure with an ‘ordinary’ hero, an amazing and magical circus and demons who live on the other side of the’veil’. Definitely a series that I will follow with interest. 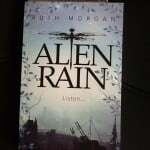 “Alien Rain” by Ruth Morgan was a lovely surprise. In essence it is a science fiction story but with Earth being the planet being excavated years after it had fallen to a mysterious invader and the explorers are settlers from the planet Mars and they are excavating the city after which their home settlement is named- Cardiff! . The descriptions of the city and in particular the Museum of Wales really adds to your appreciation of a very good story.When Bree was chosen to be part of the team of explorers it was a complete surprise, as she is not one of the top students in her class, so why was she chosen? The answer brings a fitting climax to the story. I will definitely be looking out for this author in the future and have high hopes for more from Firefly Press (who are based in Wales). 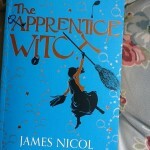 “The Apprentice Witch” by James Nicol is a truly super read. The heroine Arianwyn fails her witch’s assessment and gets sent off to a small remote village as an apprentice. Then strange things start happening and Arianwyn has to pull out all the magic that she can find. This is a lovely story about being different and being able to succeed despite this. 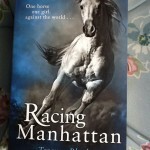 “Racing Manhattan” by Terence Blacker (NG) is the first of two titles set in the world of horse racing. Whilst I have read “horse” stories as a child I have not read those set in this particular world. The book is aimed at teens and deals with difficult issues but in a very sympathetic way. I really cared what happened to the heroine Jay as well as to the real star, Manhattan. 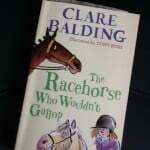 “The Racehorse who wouldn’t gallop” by Claire Balding and with illustrations by Tony Ross is another story set in the world of horse racing but aimed at a slightly younger audience. The author is a well known commentator and ex- amateur jockey and has already written several books for adults. The knowledge that she brings to the book is very evident and she is also a good writer, so that we are totally engrossed in the story of the ten-year old heroine Charlie Bass and her lovable if rather eccentric family. “A Whisper of Horses” by Zillah Bethell (Piccadilly Press, 978-1848125346) (NG) is the last of my books to feature horses, although in this case it is the heroine, Serendipity who is trying to find the last surviving horses in Britain. the plot is set in a post-disaster country where the population in London is divided into the workers and the ruling classes. There is a barrier around the city, following the lines of the M25 and no one is allowed out. However Serendipity is determined and manages to escape; with the help of her ‘storyteller’ employer and a young smuggler called Tab. It really is a magical story about chasing your dream and making the world change for the better. “Girl out of Water” by Ned Luurtsema (Walker books, 978-1406366525) deals with the world of competition swimming and a heroine who is totally sidelined when she fails to make the summer training squad with her best friends. How she copes with this and crashes and splashes her way to success with others make up this story. It veers from sad to hysterical in turn and makes an excellent summer read. 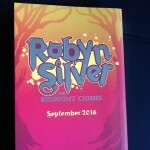 “Robyn Silver: the Midnight Chimes” by Paula Harrison is the story of an ordinary girl, Robyn Silver, who suddenly starts seeing strange creatures that none of her siblings can. Then when her school is re-located to a local ‘big house’ after a disaster, she discovers that she is a “Chime”; someone born at Midnight who can see creatures from a parallel world and whose role is to keep our world safe. This is full of action, thrills and adventure but with some very human characters that you really want to succeed. 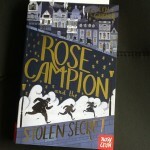 “Rose Campion and the Stolen Secret”by Lyn Gardner is a wonderful Victorian melodrama with orphaned heroines making their way in the theatre, missing heirs and a truly villainous uncle. This a fantastic read for those who have a love of Sherlock Holmes or the books of Robin Stevens and I am really looking forward to seeing some more stories featuring Rose and her friends. “Stormwalker” by Mike Revell (Quercus, 978-1784290696) (NG) is yet another amazing story from the author of “Stonebird” . The hero Owen lives with his father and it is just over a year since his mother has died. Owen suggests that his father re-starts writing a novel to help him get over his grief, but what happens next is totally unexpected – Owen finds himself transported into the story as one of the main characters. Unfortunately the story is a dystopian one and Owen’s alter ego finds that he and those around him are in great danger. So how can Owen save the characters whilst still helping his dad get better. this really had me on the edge of my seat and longing to know the outcome. “The girl from everywhere” by Heidi Heilig (Hot Key books, 978-1471405105) (NG) Is a fantastic time travel fantasy where the heroine Nix travels through place and time using old maps. She is part of the crew of an old pirate ship and her father is the captain; his mission in life is to go back and save his wife’s life. However they can only go to a specific time once and their attempts are also hindered by the wrong maps and some true villains who want their help for ‘nefarious’ purposes. This was a really original story and I thoroughly enjoyed it. 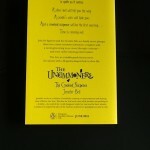 “The Crooked Sixpence” (The Uncommoners series) by Jennifer Bell. I really loved this story of an alternate London called Lundinor, that exists below our own city. Ivy and her older brother Seb are left alone when their grandmother is admitted to hospital after a fall (both of their parents are away working) and then strange things start happening and they find themselves transported to Lundinor via a suitcase ! All this is linked to their grandma losing her memory many years before and they face danger and excitement as they try and solve the mysteries. “Rose in the Blitz” by Rebecca Stevens (Chicken House, 978-1910655542) is the second in the series about Rose, the first one being “Valentine Joe” when she goes back to the first world war and meets an ancestor. In this book the link to the past is her grandmother and we are taken back to her life during the London blitz. It is a really emotional story and the end just about had me in tears. This really mixes a beautiful story with the reality of life during the war and I know I will be recommending it to schools for their libraries. NG With thanks to the publishers and Netgalley for access to the e-proofs.